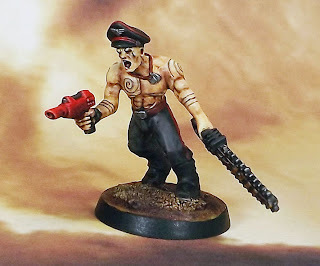 An expert in inter-tribal and ritual warfare Commissar Skulthorpe has had a long association with the Holy Ordos Xenos in matters involving the orks and other primitive alien races. 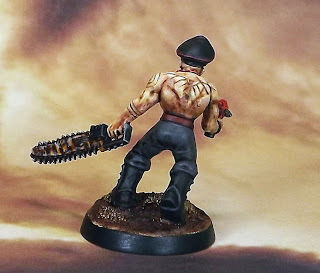 His reputation was made with a series postings to newly recruited feral guard regiments where his methods of assimilation with the tribal structures and traditions before introducing the Imperial Creed proved very effective. He is however dogged by rumours of ritual cannibalism and involvement in blood sacrifices. So he is all pained, varnished and sitting on the shelf with the rest of the band. Sorry about the poor photos: I'll try to get some better ones with the rest of Klein's retinue soon. I can't say I'm all that pleased with him. I'd hoped that once he was painted that would help like it did with Sir K. Perhaps I've stretched the commissar archetype too far. Maybe a storm coat would have helped.